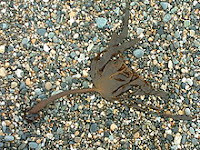 Brown Algae Extract Reduces Body Fat Without Dieting or Exercise. Ecklonia Cava Polyphenols Help Shed Weight Even in The Presence of a Slight Caloric Surplus. Ecklonia cava algae the term "floatsam"
With obesity being among, if not the major promoter of all modern diseases, researchers around the world are constantly trying to find magic bullet against, a condition of which hardly anyone argues that it could not be prevented in 99.9% of the cases by diet and lifestyle changes, or even better, leading an active and healthy life from early childhood to old age, alone. Be that as it may, if the horse has already bolted, the help of a side effect free dietary supplement, to promote and accelerate the results of consistent life style interventions, would unquestionably come handy. In a recently published study (Shin. 2011) a polyphenol extract from Ecklonia cava, a brown algae that has long been used in traditional foodstuff and folk medicine in Asian countries, turned out to be a another potential candidate in the long list of natural diet aids in the arsenal of holistic medicine. For 12 weeks, a group of 97 overweight (not obese; BMI 24-29kg/m²) Koreans (mean age 40.5yr) consumed a test liquid containing 0 g of fructose, 0.65 g of dextrin, 12mg of sucralose, 0.15 g of sodium chloride, 0.6 g of citric acid, 0.15 g of vitamin C and lemon ﬂavor. Depending on which group (C, LD, HD) the respective subject had been assigned to, the content of the otherwise identical cans held had been enriched by 0mg (C), 72mg (LD) or 142mg (HD) of an Ecklonia cava extract with a total polyphenol content of 98.5% (measured in phloroglucinol equivalents). The subjects were adviced to consume the drink in between meals, but otherwise to maintain "their usual dietary intake and physical activity", so that any changes in antropometric measurements, dietary intakes and biochemical and hematologic parameters would be attributable to the Ecklonia cava polyphenol (ECP) supplementation. In contrast to some other natural weight loss supplements (cf. yesterday's news on green tea extract), the dose response curve does not seem to flatten out. At least within the range that has been tested in this study, doubling the dosage even produced a 2.25-fold increase in body fat loss. The polyphenol extract does not seem to work its magic by appetite suppression. 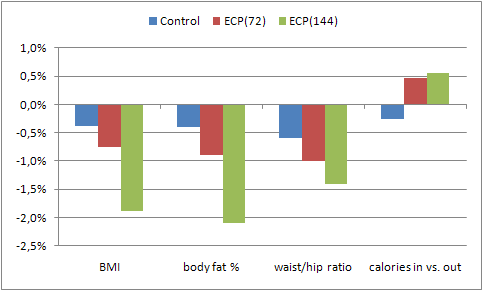 As the data in figure 1 shows, the difference between calorie intake and estimated calorie expenditure did even rise by 4.7% and 5.5% in the ECP(72) and the ECP(144) group respectively (judged by the estimated calorie-expenditures both groups had a minimal caloric surplus of 79 and 106kcal). If you also take into account that subjects in the ECP groups, "showed significant decreases in total cholesterol level after 12 weeks by 7.1% [ECP(72)] (p < 0.01) and 9.3% [ECP(144)] (p < 0.001), [...] significantly reduced serum total cholesterol levels (p < 0.05 and p < 0.01, respectively)" and 10.0% and 14.3% lower LDL and 8.6% and 13.3% higher HDL levels, the slimy sea food from the Far East does already appear more appetizing, doesn't it? To eat your way through >10kg of sea weed (this is what the yield of the extraction process described by Lo et al. (Lo. 2009) would suggest to be needed as "basis" of a high quality extract), would nevertheless be pretty hard, which is why I tend to think that this is one of the few cases, where you should prefer the highly processed over the unprocessed variety of a natural superfood. suppressing fat‐induced damage of liver tissue. Be that as is may, as long as it entails small, but statistically significant, side-effect-free improvements in body-composition, lipid profile and glucose management, I doubt any overweight end-consumer will give a damn about the underlying molecular mechanisms which certainly won't make the necessary lifestyle changes obsolete, but could potentially multiply and accelerate their effects.